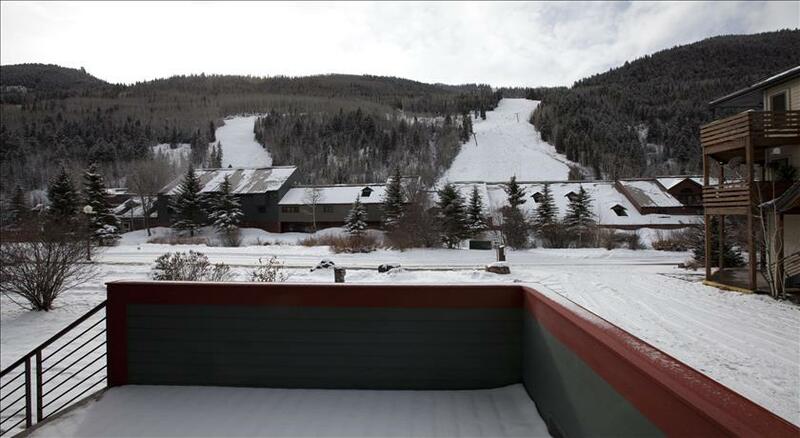 Telluride Lodge is located only 200 feet from Lift #7, The Coonskin Lift, and a few blocks from downtown Telluride and the Gondola making this a tremendous value for its size and location. 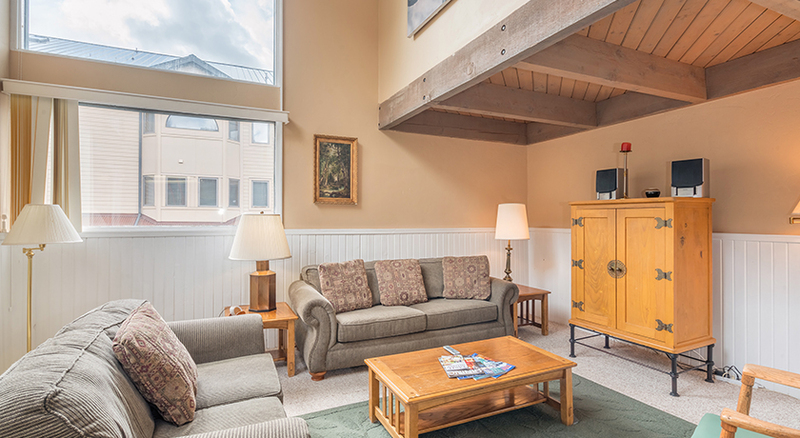 With a bonus room for one person, the value for this lodging option can't be beaten. 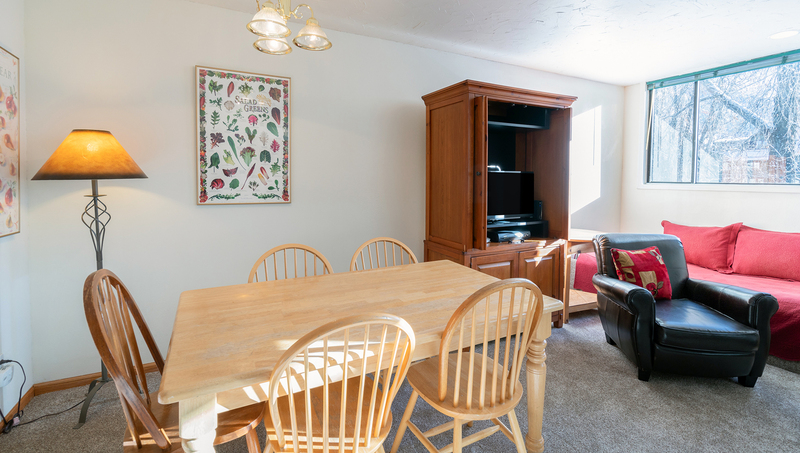 If you're looking for simple, basic, neat accommodations within walking distance of everything, this Telluride Lodge condo will fit the bill. The entrance to the condo is from the indoor 2nd-floor hallway. The childâ€™s room (a very small bedroom) is on the entry level, with a twin bed. Upstairs a half-flight is the kitchen and living room with an electric fireplace, a queen sofa sleeper, large flat-screen HDTV and a stereo with CD, VCR and DVD player. Upstairs another eight steps on the third level are the master bedroom with a double bed and a bathroom with a shower only, accessible from the hall. In fall 2011, we added luxury linens and lush, thirsty towels. Unit has views of Ski Mountain. Ski storage in hallway. The condo has free wireless internet. Telluride Lodge has common outdoor and indoor hot tubs built in 2010 for guest use that is located on the south side of the middle (400) building by the HOA office. Parking at Telluride Lodge is an outdoor lot and though ample, is on a first-come-first-serve basis. Adjacent to the Telluride Lodge is the grocery store. The free in-town shuttle bus has stops on both the north side and south side of the block. The base of Lift #7 is across the street (over the river). And historic downtown Telluride is a 10-minute walk. The high school and Palm Theater are less than a block away. Telluride Lodge is the only complex in town spread over a 5-acre park-like setting, across the river from the base of Lift #7. 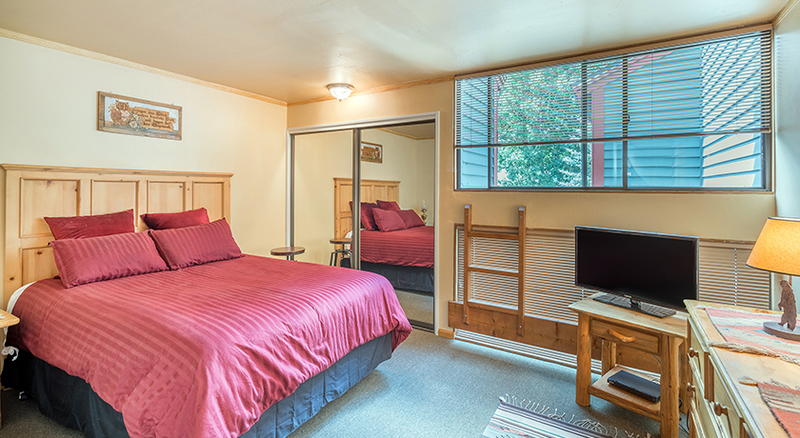 This condo has a queen bed and two twin day beds. 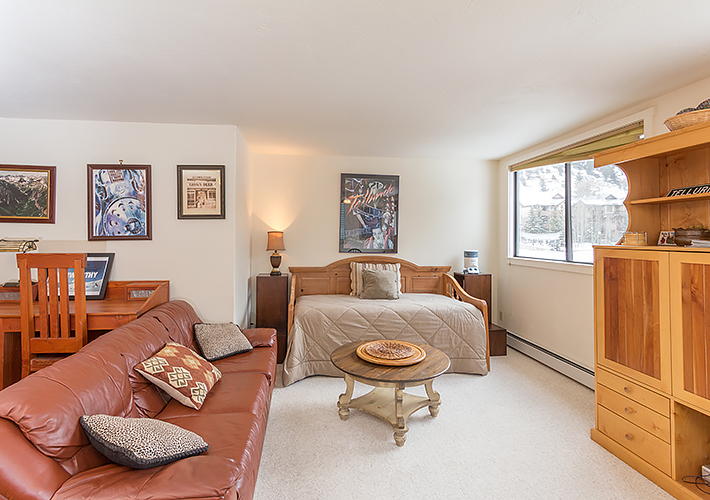 Location makes this unit convenient to everything in town as well as the ski slopes. And for those looking for economy and value, this one is a great pick. Enter the unit from the common interior 2nd-floor hallway. 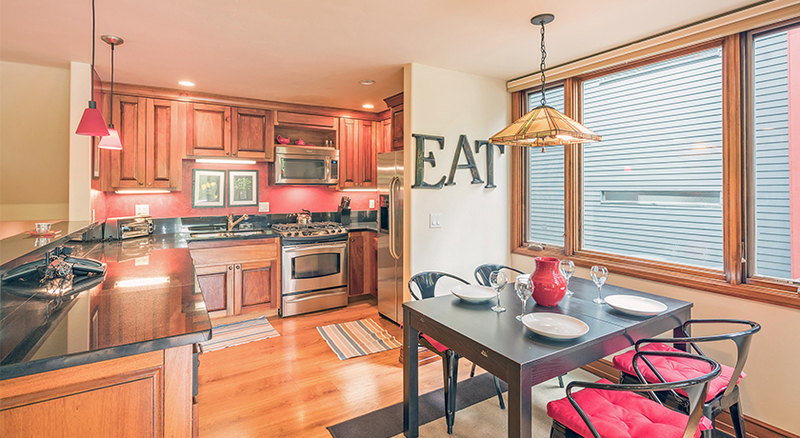 Up a half-flight is the living room, kitchen, and dining area. 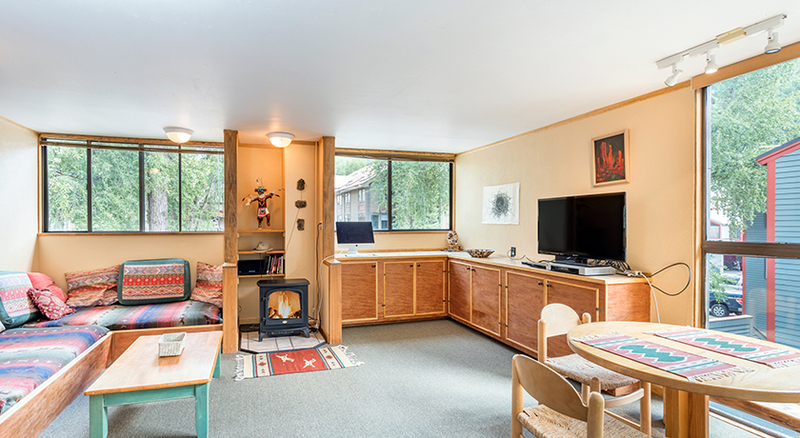 Here you'll find a TV with VCR and DVD player, Bose radio, fireplace (electric), and 2 twin beds in an "L" layout. The dining table seats 4. 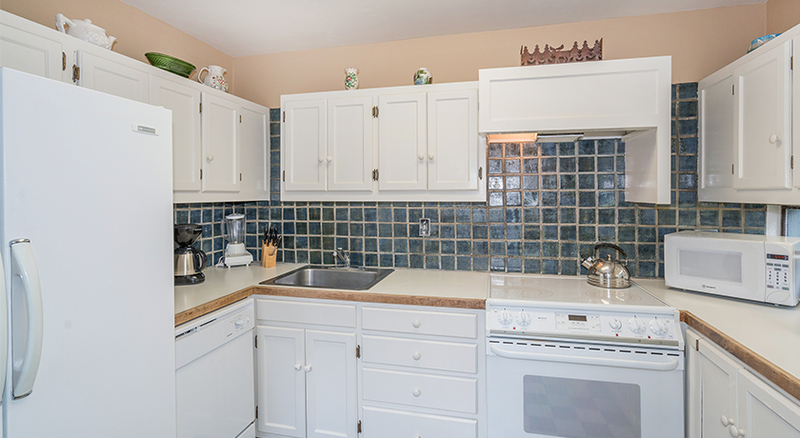 The kitchen is bright and fully equiped. Up another half-flight is the bathroom with shower only and bedroom with queen bed and TV with DVD player. 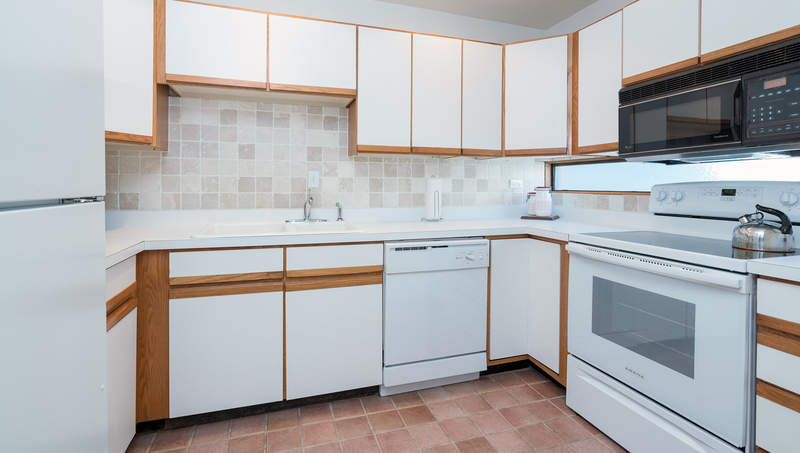 The washer/dryer for the unit is located on entry level in the utility room. Ski storage is located just outside the front door in the hall closet. 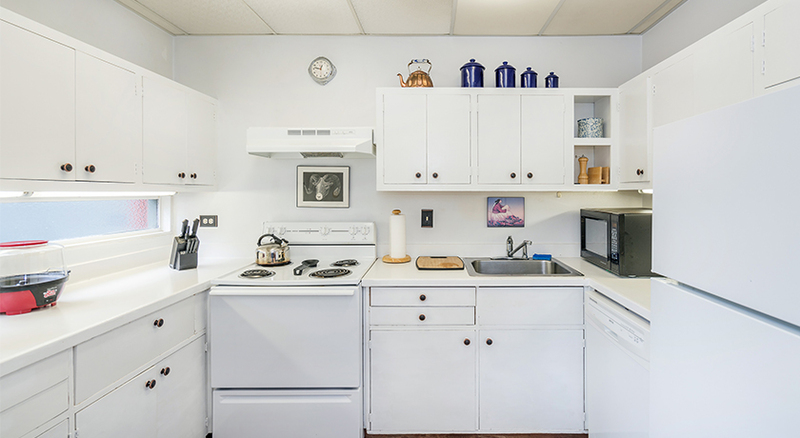 The complex has free wireless internet and private parking lot on site. There is a new (2010) addition with common indoor and outdoor hot tubs and a steam room, located near the office. Just to the north of the Telluride Lodge complex is the grocery store, and just to the south is the San Miguel River and the base of Lift #7 (Coonskin Lift). The free in-town shuttle has stops on both sides of the block, and historic downtown Telluride is a 5-10 minute walk away. Town Park and Festival Main Stage is about 6 blocks from the condo. 2BD / 2BA. 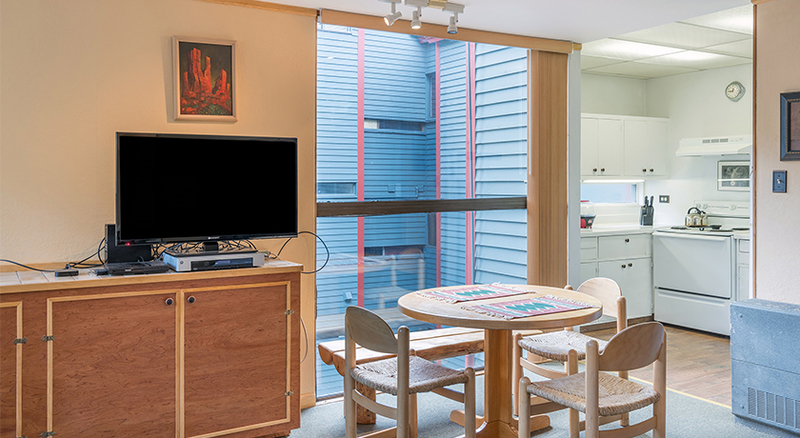 Offering neat, comfortable, rather spacious accommodation, unit #311 is a great value for families and friends. Bedding: Queen Bed, 2 Twin Beds, 2 Twin Day Beds. 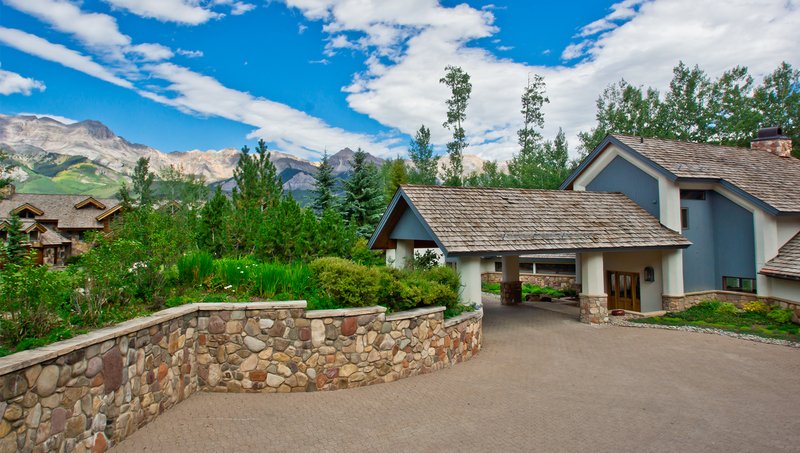 The Telluride Lodge is the only property in Telluride spread over five acres in a park-like setting! 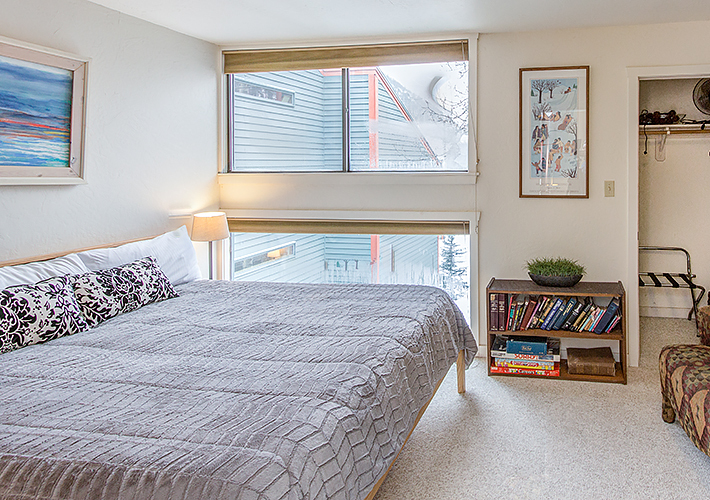 Being in town, and so close to skiing, makes it a great place to stay. Laundry facilities are available on premises. *Complex has free wireless internet*. Parking is in the lot on site. There is a new outdoor hot tub and indoor hot tub plus steam room on the south side of the complex, near the Office. The grocery store is adjacent to the complex. Just across the street to the south is the San Miguel River and base of Lift #7 (Coonskin Lift). The free in-town shuttle has stops on both sides of the block. Experience Telluride as if it was still the 80s! 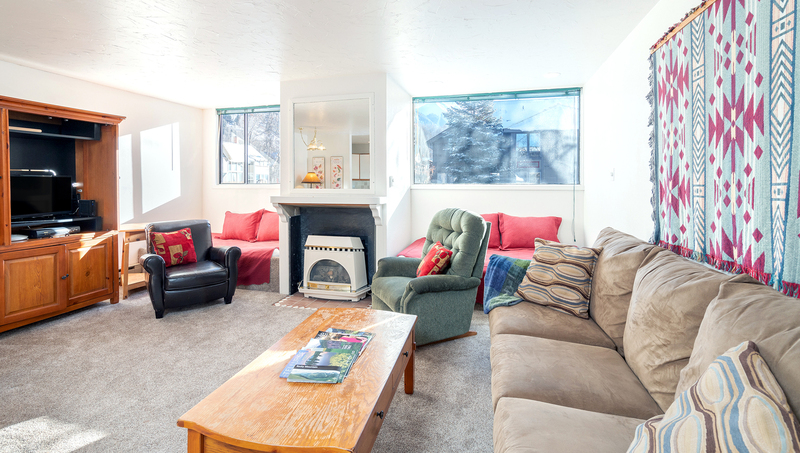 This funky one-bedroom lodge is in a prime location in downtown Telluride with easy access to skiing, hiking and so much more! 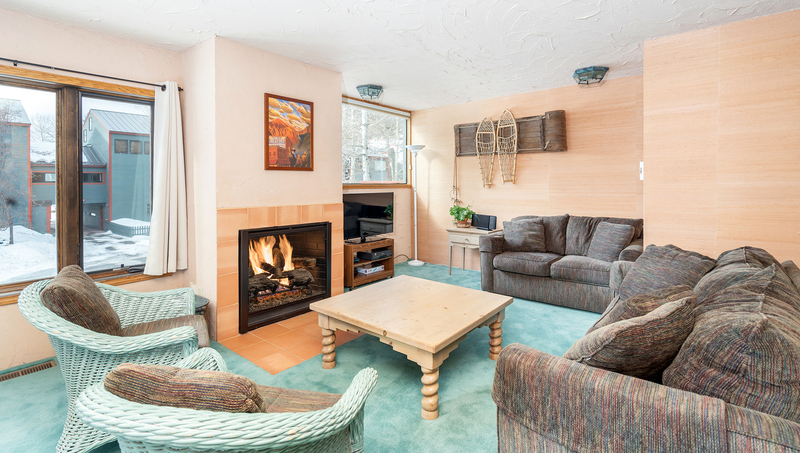 This funky condo in the Telluride Lodge throws it back to the skiing heyday of the 80s - with prices to match. Guests enter this unit from a second-floor hallway and are welcomed into a cozy, retro living space down a small flight of stairs. 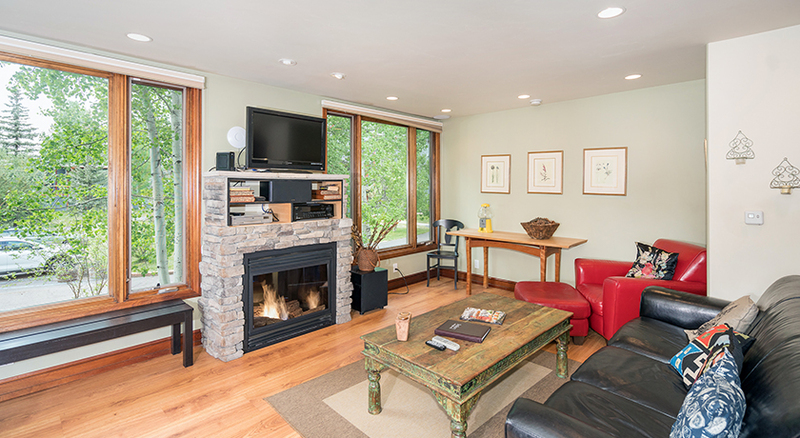 The living room has a flatscreen TV, DVD player and an iPod dock all nestled in front of a gas fireplace. 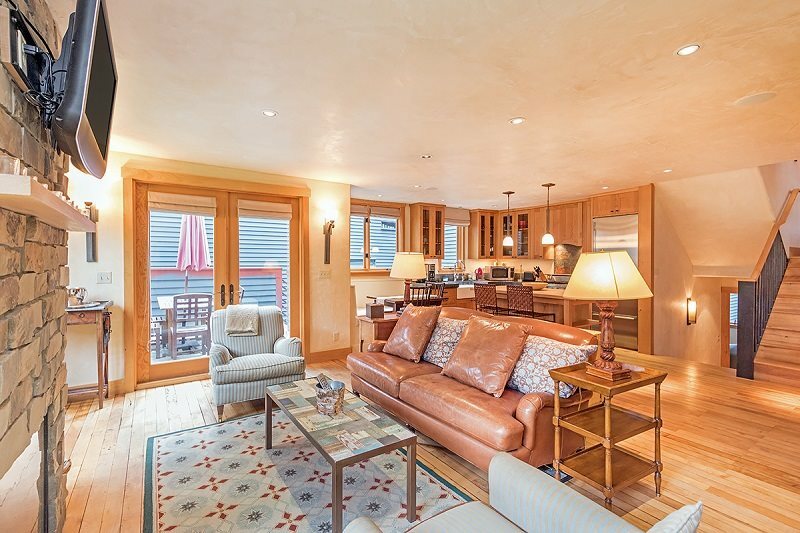 A full-size sofa sleeper provides extra accommodations for guests, and a deck off the living room overlooks the large grassy common space at the Telluride Lodge. 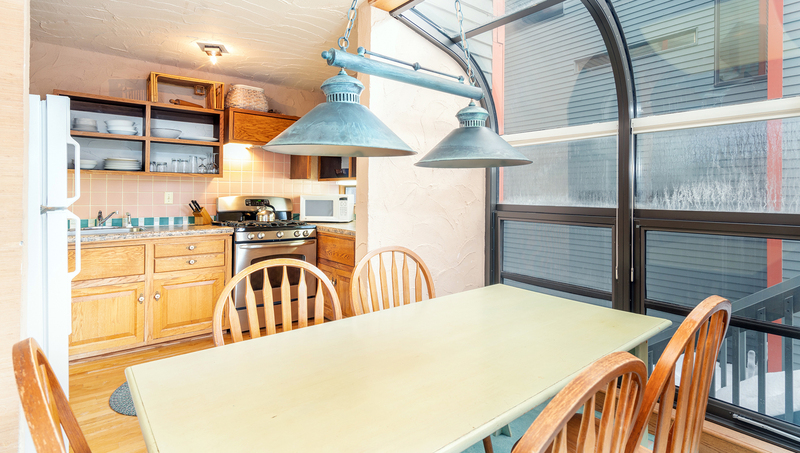 The living room is open to the dining room, which has a ton of light due to a solarium, as well as the fully stocked kitchen. The king bedroom is located on the lower level of this unit, where a full bathroom with a built-in tile tub is also located. 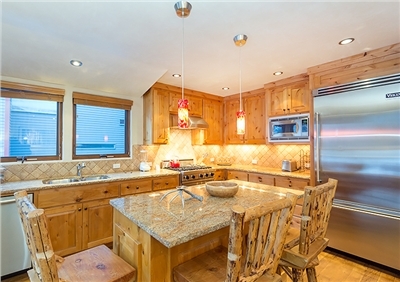 The Telluride Lodge is spread out over five acres and has indoor/outdoor hot tubs, grills, picnic tables and more. 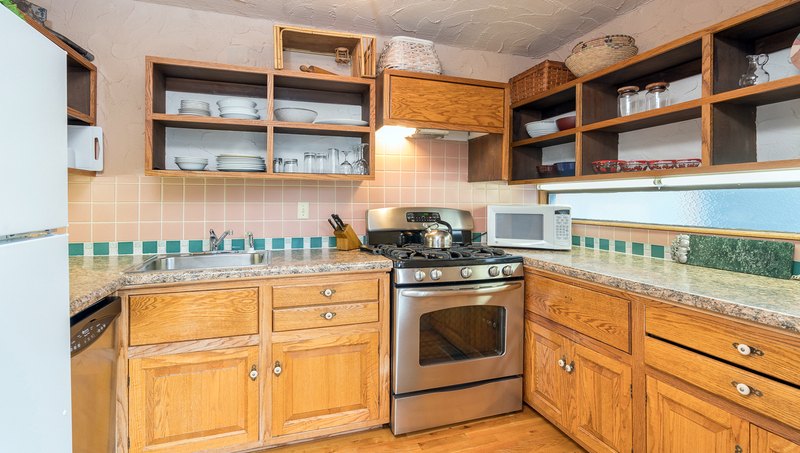 Itâ€™s located steps from the grocery store and just across the street from Lift #7 (Coonskin). 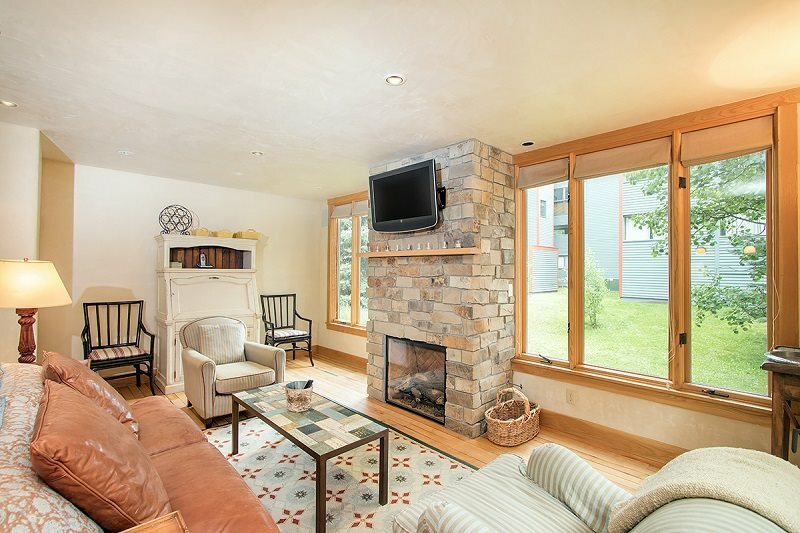 Everything is within walking distance from the Telluride Lodge, including hiking and biking trails, the river walk, shopping, restaurants and more. If you prefer transportation, the free local bus, the Galloping Goose, picks up across the street. 3BD / 2BA. 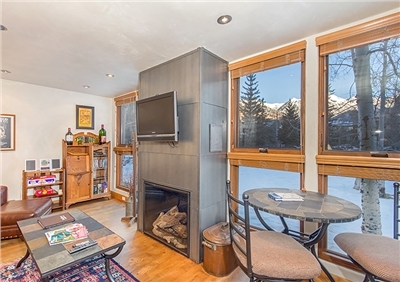 This remodeled condo looks out over that lovely open space, with surrounding San Juan Mountains. Private Deck. Bedding: King bed, Queen bed, 2 twin beds (can be converted into a king bed). 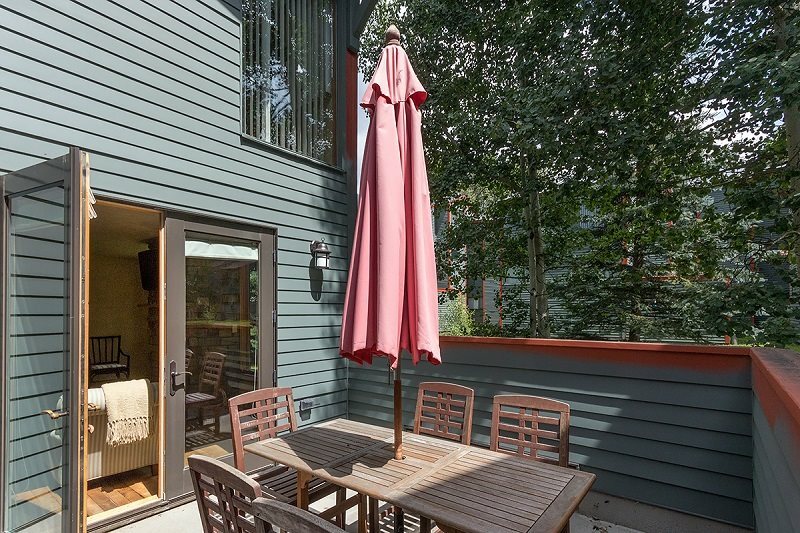 The only property in Telluride spread over five acres in a park-like setting, it's also amazingly convenient for both summer and winter activities. Bedding: King Bed, Day bed with Trundle Bed. 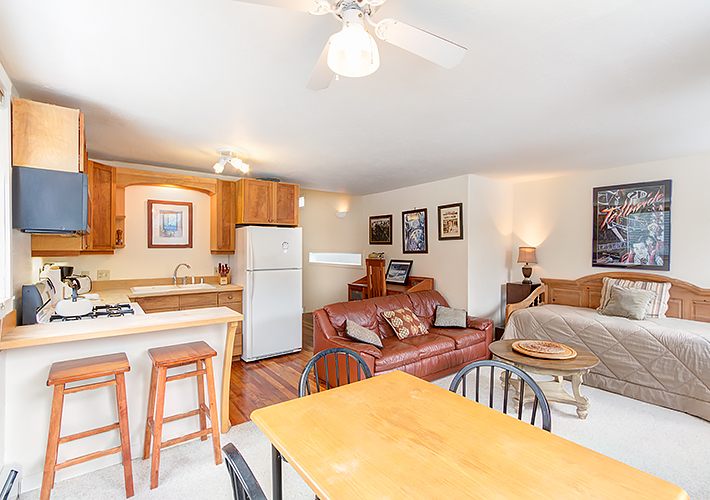 You'll enter the unit and go upstairs a half-flight to the kitchen and living room. Here you'll find a sofa, day bed and dining table for 4. 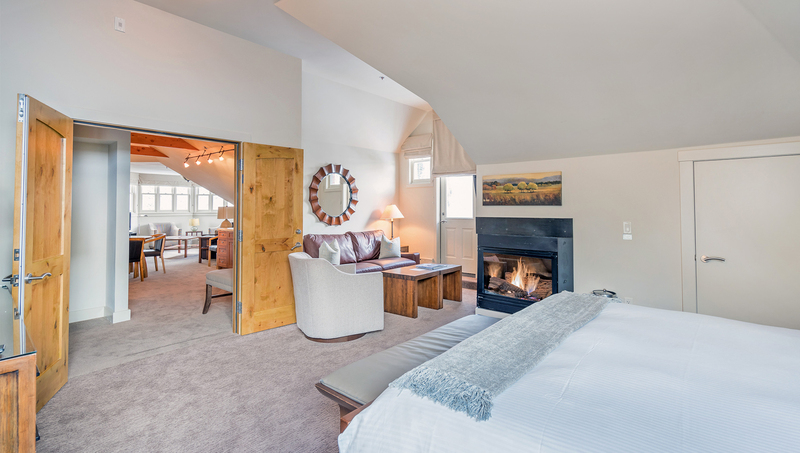 The bedroom upstairs has a king bed and views of the lodge. The bathroom has a shower/tub combo and private washer/dryer. 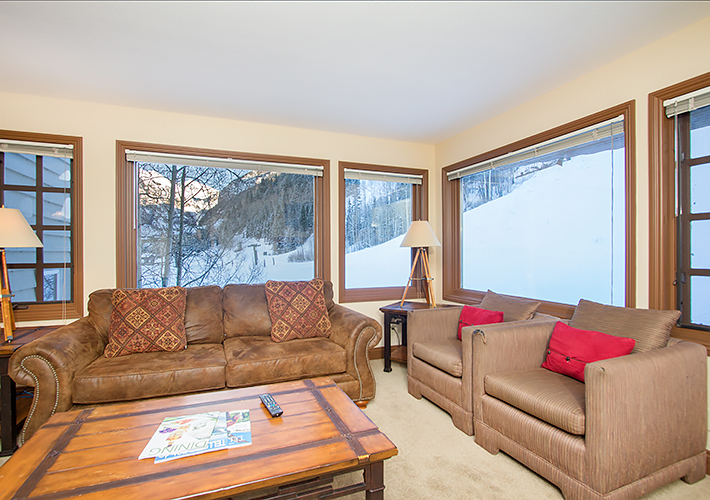 Telluride Lodge is located in Telluride's west end, just across the street from lift #7. On shuttle route to downtown. Bedding: Queen bed, Queen bed, 2 twin beds, Queen sofa sleeper. 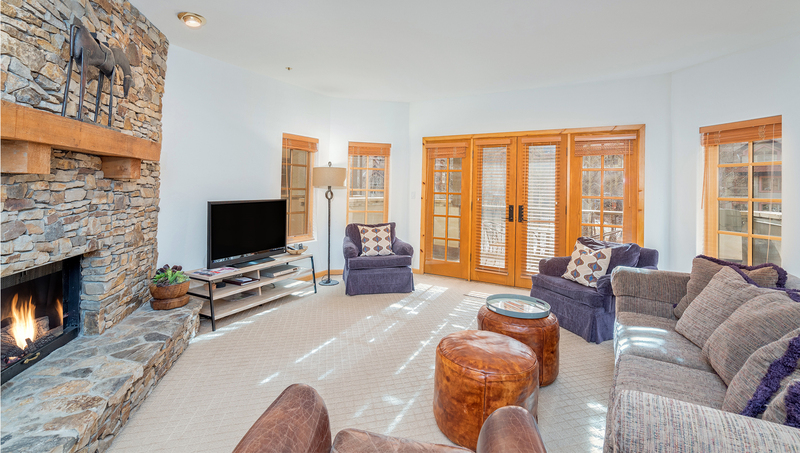 Surprisingly plush, the extra loft upstairs adds value to this spacious condo. You enter the unit from the 2nd floor interior hallway. 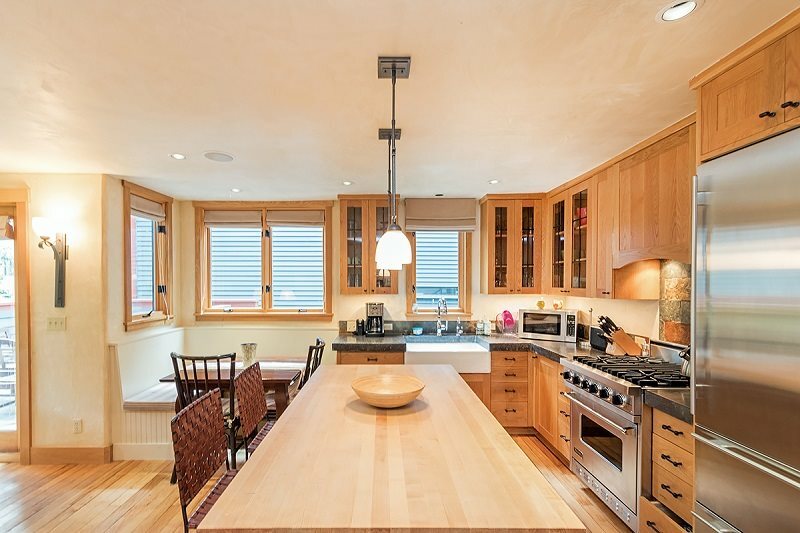 Up a half-flight of stairs is the kitchen, dining and living room. Here you'll find the queen sofa-sleeper, a fireplace, and flat-screen TV with DVD/VHS player, and stereo. 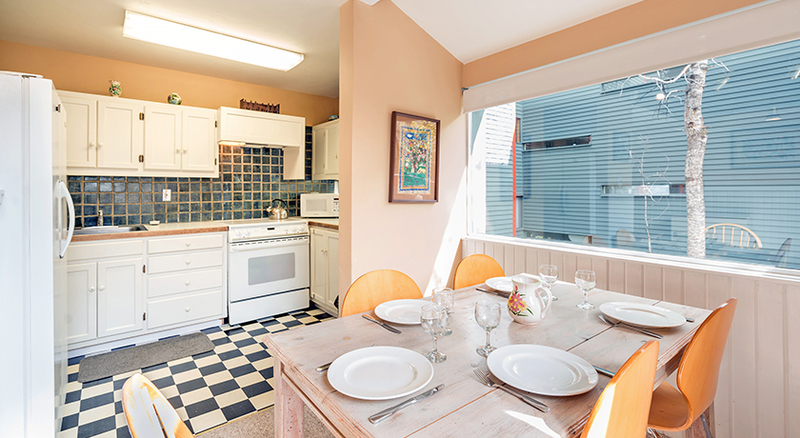 The full kitchen is open to the dining table that seats 6. The master bedroom is up another half-flight, with a queen bed and an in-suite bath with shower only, and TV with DVD/VHS. The second bedroom with queen bed is another half-flight up and also has its own TV. On that landing is the second bathroom with fully-tiled shower, and the loft is up a few more stairs from there. In the loft are two twin beds, TV with VHS. There is a door that closes off this upper suite of rooms from the downstairs, so the folks staying up to play cribbage won't disturb. 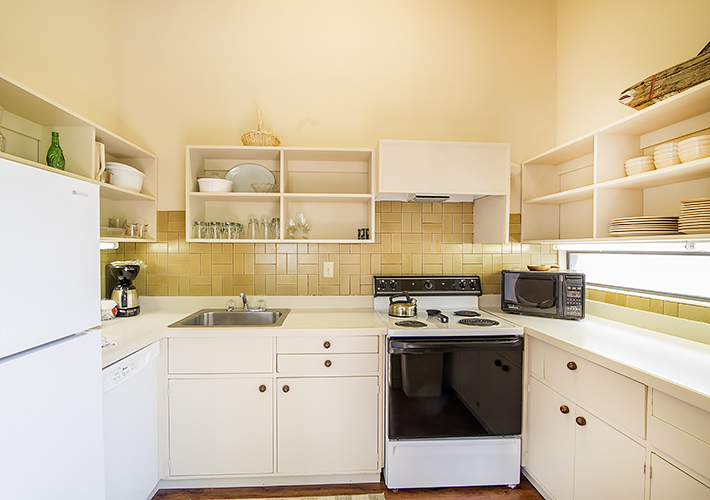 On the entry level of the condo is a bathroom with shower only, and the washer and dryer for the unit. A Ski storage closet is in hallway across from the entrance. 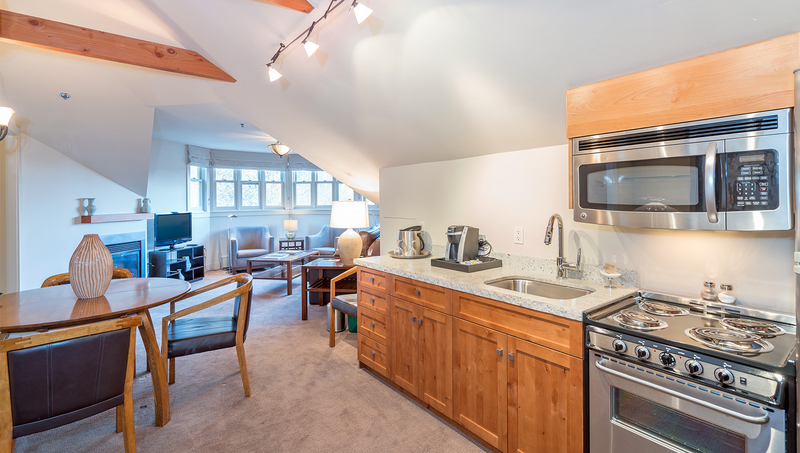 The condo provides complimentary wireless internet. 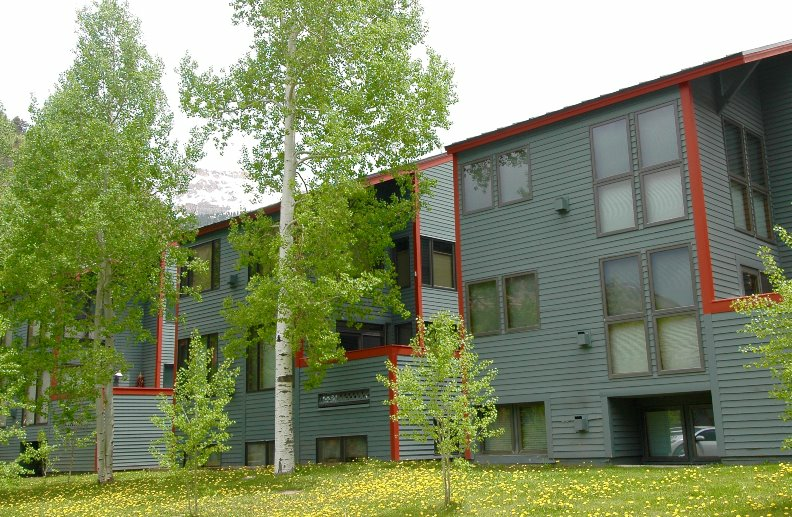 Telluride Lodge has common outdoor and indoor hot tubs built in 2010 for guest use that is located on the south side of the middle (400) building by the HOA office. Parking at Telluride Lodge is outdoor lot. Across the street to the south of the complex is the base of Lift #7 (Coonskin Lift) where you'll also find a ski rental shop, and coffee shop. On the north side of the complex is the grocery store, with high school and Palm Theater across the street. 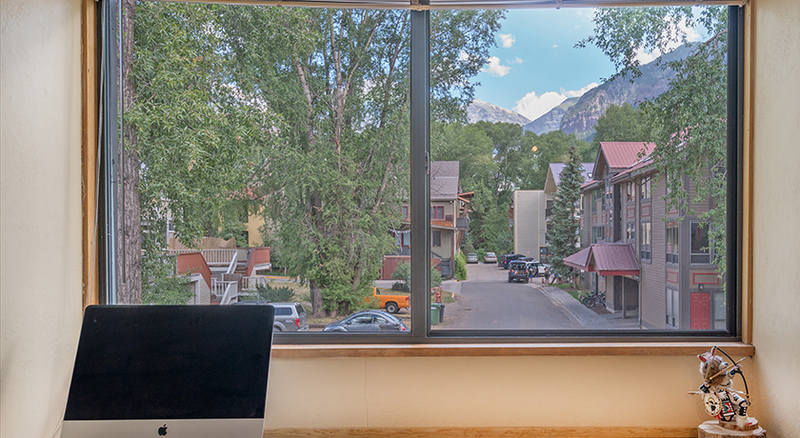 The historic downtown Telluride is 4 blocks away, a 5-10 minute walk. 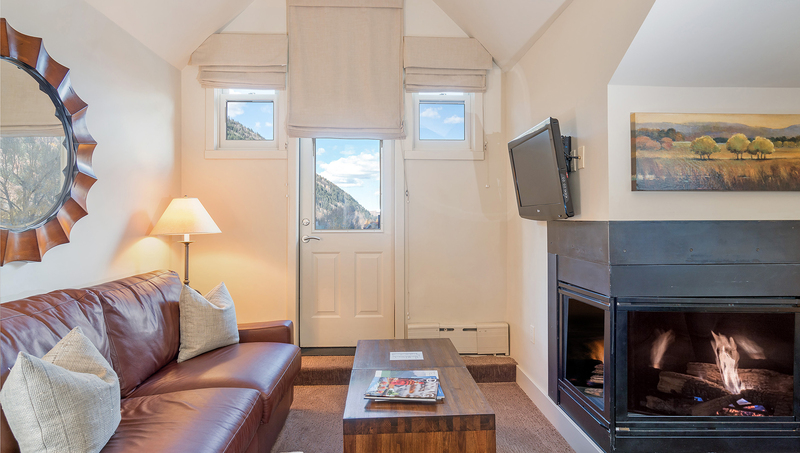 The free in-town shuttle (Galloping Goose) has stops on both sides of Telluride Lodge. Trout do still swim in the San Miguel River, with the river trail leading to additional hikes to waterfalls and overlooks, as well as the Town Park & Festival grounds (6 blocks). 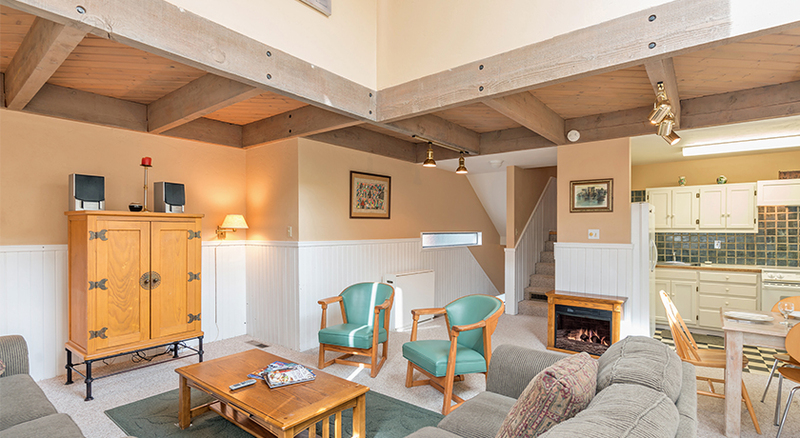 3 bedroom, 3 bath condo with vaulted ceilings, plenty of sunshine, and a south facing deck. Bedding: King, King, Double, Twin, Queen Sofa-Sleeper. 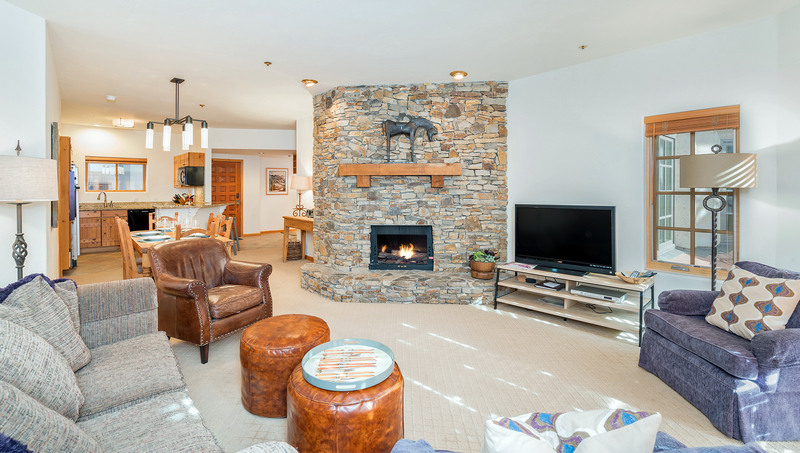 This beautifully furnished condo is ideally located a short 100 yards from Lift #7 (Coonskin) in the Telluride Lodge complex. 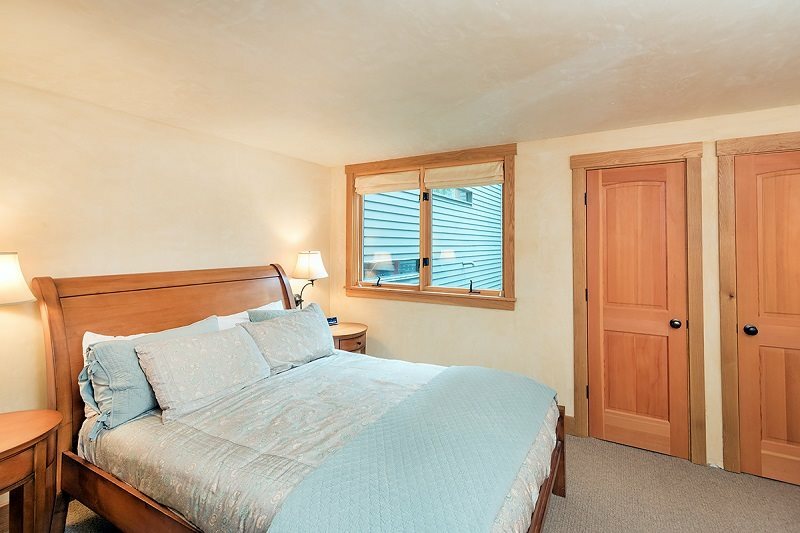 This three bedroom, two bathroom condo has a queen bed in the master bedroom, a queen in the second bedroom, and a captain's bunk in the third bedroom. There is a deck off the living room with access to the complex courtyard. 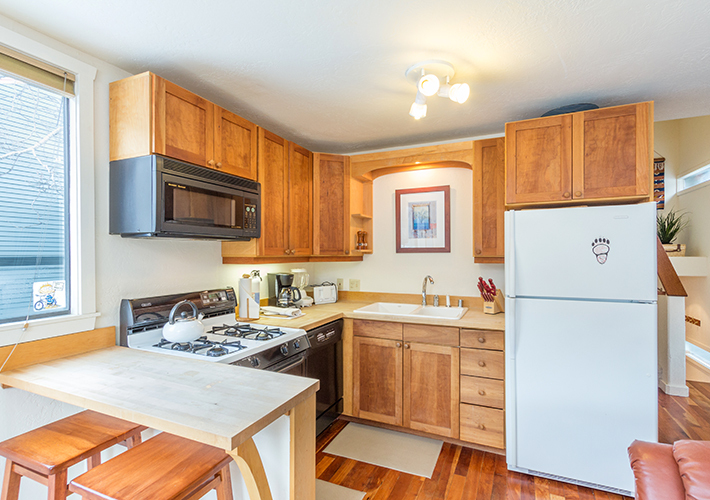 This unit also features a full gourmet kitchen, gas fireplace, flat-screen TV and personal washer/dryer. 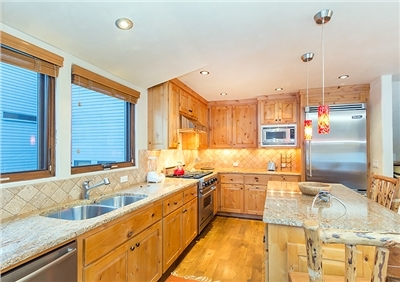 Telluride Lodge features indoor and outdoor hot tubs and ski lockers for each condo. 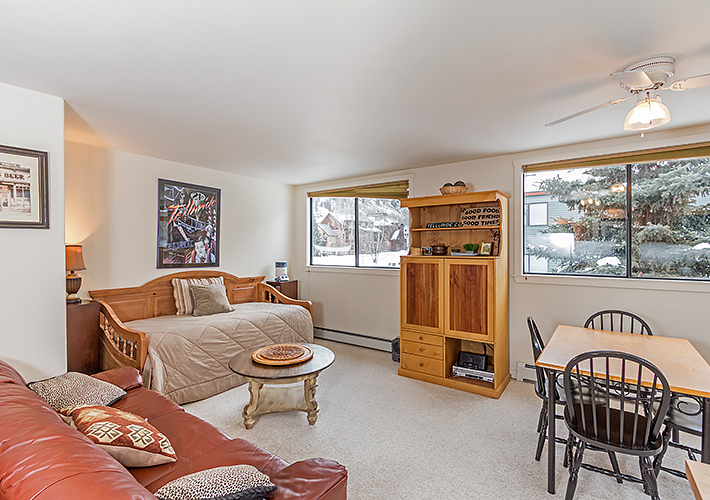 Enjoy this updated, bright condo which boasts a large patio, gourmet kitchen and ski locker room. 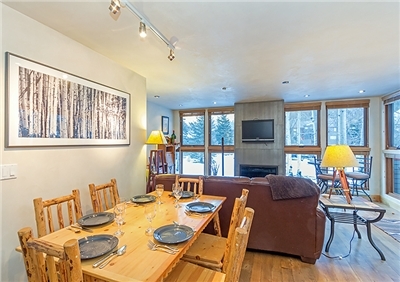 Telluride Lodge 404 is an ideal rental home for families and large groups who want the convenience of staying in the heart of Telluride. 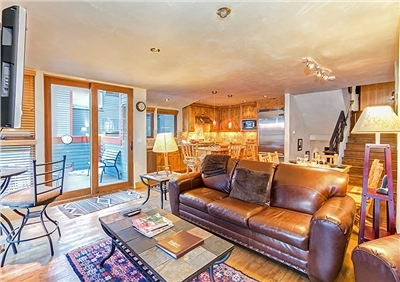 The Telluride Lodge complex offers common hot tubs, a large grassy area and reserved parking.